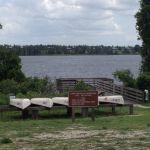 Ask fellow campers about "Lake Louisa State Park" and nearby attractions. Question: How are the mosquitos in the middle of October? Answer: The middle of October is still summer in central Florida and mosquitoes have been bad when we were there. Question: I've noticed a few reviewers have mentioned the sewer on site. I was under the impression that sites here do not have sewer connections. Are they referring to the dump station, or do some sites have a sewer connection? Answer: Some sites have sewer connections. They are 16, 18, 30-40. The rest do not have sewer. The dump is convenient, though. Nice campground. Two lakes. Boat ramps over infested with weeds. Long drive into campground from check in. 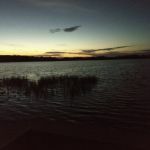 We camped at Lake Louisa State Park in a Motorhome. I can't believe this was our first visit to this park! Great location to attractions, close enough to Kennedy Space Center for a visit, and a lovely park. There are three loops in the campground with a mix of back in and pull through sites, some with full hookups. As previously mentioned, almost all pull throughs have a severe curve, so parking a big rig to avoid the trees/shrubs and posts near water faucet can be hard. With our site, 16, it would have been easier to back in on the exit side and park angled. While the campground is mediocre, the rest of the park more than makes up for it. Several miles of well marked, well maintained trails for walking dogs, a huge field near the sand volleyball court we used to play frisbee with our guys, and a pretty, quiet park. We'll be sure to be back! A couple of dings. No dog waste bags anywhere in the park, and the weekends bring a lot of day use visitors to the lakes nearest the campgrounds resulting in lots of cars, traffic, barking dogs, noise, and extra use of the campground facilities. Excellent Verizon coverage. We camped at Lake Louisa State Park in a Motorhome. This is another excellent Florida state park. The sites are clean and well maintained. We did have to use external levelers in the back to get level, but only two inches. The bathrooms are sparkling clean, with good sized showers with hot water. Laundry facilities on site that take credit and work well. Lots of trails in the park and a good road for biking. Lakes with boat launches and boat rentals available. Very near all theme park attractions in Orlando. Quiet at night. We would definitely stay again. We camped at Lake Louisa State Park in a Motorhome. 20-30 minutes to theme parks. Only stayed one night on our way back home but would like to have stayed longer. Campground is located about three miles in from the entrance so no road noise. Paved roads throughout with crushed gravel/shell sites. Typical of Florida State Parks sites are large and spaced far apart with trees and bushes for privacy and the feeling of being in the woods. Water and electric well placed. OTA channels available and good Verizon cell phone. Very clean restrooms and showers. Canoe, kayak and bike rentals available. Site had picnic table and fire ring. We would camp here again if in the area. We camped at Lake Louisa State Park in a Travel Trailer. We kangaroo camped for seven days, stayed at three sites. The first was 28 which was not level and open sun. Number 8 was level with some shade. Number 47 was the best, had open sun and complete privacy on the right side. All sites had plenty of gravel and a nice patio. Good black top roads to each loop. This campground is excellent with good cell service and good chance for satellite reception. Each bath house has one set of washer/dryer, new machines. Machines take quarters or credit card. The laundry floor was dirty, needed to be swept and washed. Other than the laundry room, the bath houses were clean. 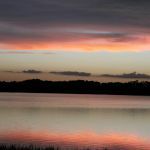 We camped at Lake Louisa State Park in a Motorhome. Oh. My. Goodness. Amazing place to stay and about 30 minutes from Walt Disney World. We should have gone there first during our trip to Florida (Stayed at Wekiwa State Park for 14 days first). We stayed about 7 days at Lake Louisa. Would not recommend to swim in Lake Louisa.... huge sign inform you of the presence of gators. The water is quite warm too and brownish color. It takes about 7 minutes to drive from the main road up to our campsite. Saw wildlife on the side of the road while there. We will definitely go back to this place in the future. We camped at Lake Louisa State Park in a Travel Trailer. Beware of fire ants. They did not came in the RV or on the RV. But they bite. Also some spiders will bite too! I would not walk barefoot there. Bring some ant killer product in your RV to secure the area around your RV. Excellent campground for Florida residents who received a 50% discount off the nightly rate of $28.00. We were on site #10, a pull-through with water and electric, no sewer. Site was not level, had to raise up the door side by 4 inches to get level. Overall park was a good experience. We camped at Lake Louisa State Park in a Travel Trailer. We stayed at site 5. A little unlevel but still very nice. Lots of traffic on main road I think for Disney. No road noise at all. There are two smaller lakes that were by our campsite and docks that go out into the lake. We did not want to launch or blow up boat as we didn't feel comfortable with the launch area. Very pretty and big sites and nice privacy. Our 37' fit in with loads of room and the camp host was a hoot! We camped at Lake Louisa State Park in a Travel Trailer. Nice clean quiet park & campground. There were some low hanging branches from trees over the park road, that we could hear hitting the roof of the motor home. Site 16, was pull thru, full hook-up & level. Downside is no shade tree. We enjoyed our one night and it was our first time. Garbage dumpsters a bit far from Dixie camp loop. Good phone signal (AT&T) and air TV channels. Will return when cooler weather to kayak. We camped at Lake Louisa State Park in a Motorhome. Lots of stores, restaurants and gas stations 4 miles down the road outside of the SP going N on US 27. So if you forget something or don't feel like cooking, there are options. Very spacious park very close to Orlando and Clermont FL. Many pull through oxbow sites, some sites include sewage. Miles of roads to bike. Many walking trails. Three lakes for kayaking. Even though it was Spring break, very quiet. Good cell signal and satellite reception, also over the air TV. We camped at Lake Louisa State Park in a Motorhome. Pickleball close by at the Clermont Arts and Rec Center. Most any retail within 15 minutes in Clermont. Walmart 20 minutes away. This is a very well maintained state park. Our site had an excellent view overlooking Lake Hammond. The site was a gravel pull-through with plenty of room for our toad. Just a short walk to the extra clean restrooms and showers with laundry although the washing machine was missing, the dryer was available. Verizon signal was ample but not real strong. 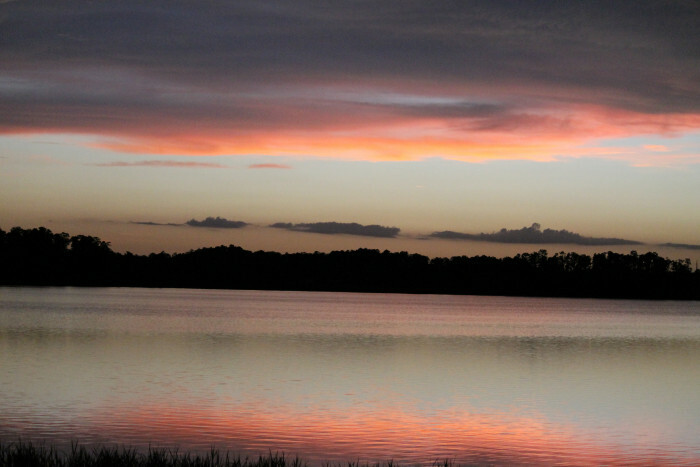 We camped at Lake Louisa State Park in a Motorhome. Our dog did not like the Disney fireworks that occurred each night a 7:55 pm and went for 20 minutes. Plenty of things to do in the area, relatively close to Disney and other Orlando attractions. Several Geocaching finds inside the park. We stayed on pull through site 19 (water and electric) for five days. The park is nice and quiet. I don't, however, understand why they only have a couple sewer sites. Our site didn't have sewer but the one directly across the street did. Given that the units in here are large Class A, C, and fifth wheels, they should extend sewer throughout. All sites are reserved for the foreseeable future so the park is popular and would pay for itself. The facilities are very nice. There is also a laundry and canteen plus you can rent kayaks. We camped at Lake Louisa State Park in a Motorhome. 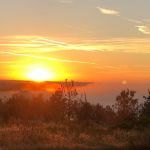 Large park with about 22 miles of easy hiking trails, about ten miles of paved biking roads with slight elevation changes. Two lakes that are great for fishing, kayaking/canoeing and just sitting on the docks viewing the scenery and sunset. A short drive or bike ride to the beach from the campground. Small camp store at the campground to rent bikes or kayaks/canoes and buy a few necessities. And, ice cream. A lot of undergrowth is gone since our last visit, but makes for a more open campground and still some privacy. Very neat and clean campground and friendly staff. Clermont nearby for shopping, eating and a nice winery. 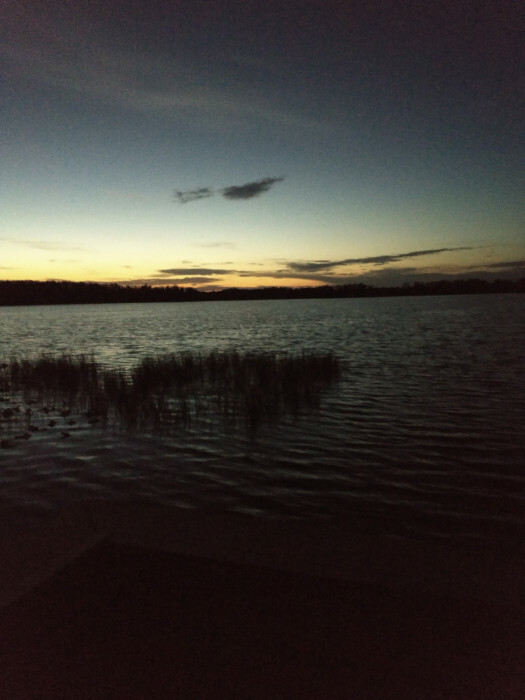 We camped at Lake Louisa State Park in a Motorhome. Hike the many easy trails. Enjoy the sunset at the Dixie Lake fishing pier in the campground. 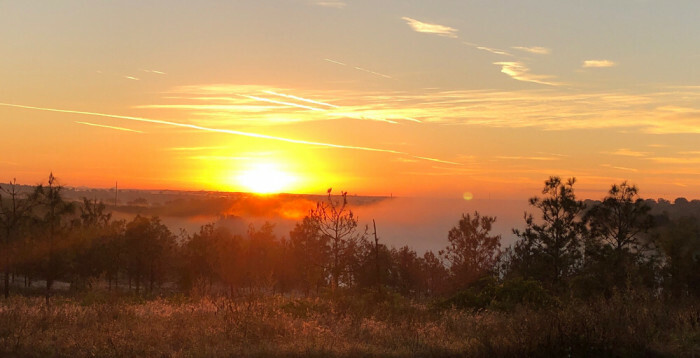 Visit the Lakeridge Winery and Vineyards in Clermont. Loved our stay here, facilities were neatly kept and clean. Utilities worked well along with Verizon and OTA TV channels. The park area is huge and there is a lot to see and do. During the winter they have a food truck on weekends, think it's all week in the summer. Hwy 27 is under construction and down to one lane each way, which was a pain. We would definitely stay there again. We camped at Lake Louisa State Park in a Travel Trailer. Local Chef food truck is parked by the camp canteen and has good breakfast and lunch options. Best sweet potato fries I've ever had. Also good hamburger and quinoa stir fry. They seem to close around 2 so go early though they may have longer hours some days and some seasons. Disney World is easily accessible. Plan on a 45 minute drive from the time you leave your site to the time you're parked in the Disney parking lot. Disney was fun - more fun that we expected. Recommend buying park tix in advance, downloading app, setting up Fast Pass and making dining reservations for dinner. Resign yourself to how expensive it is (rather than fret about it and forfeit the joy). Don't accidentally end up on Schofield Road! We re-routed our GPS to skip a couple sharp turns and ended up on this road which is CLAY and over 5 miles long. Our RV and toad were filthy. Disney is just down the road and Clermont has all types of restaurants to choose from. If you do not have a SunPass, bring lots of coins for tolls. Bring what you need to eat and drink with you as it's a bit of a drive just to leave the park and more to get back into town. Lots of services within a few miles, north on Hwy 27. Showcase of Citrus was just a couple miles south of the park. Very neat place with lots to do and decent prices. We parked here to visit Disney which was a little far, but doable. We tracked north to DreamCatcher Hourse farm and rescue. Amazing hour long ride that even took us into the lake. Clermont is a small town but many of the conveniences of a bigger city Wal Mart, Publix, etc. it's a growing suburb of Lake Buena Vista but still quiet enough to enjoy. Disney World is just 25 minutes away. Clermont is just 4 miles North on Hwy 27. Great movie theater, pizza shops, Walmart & BJs wholesale club. There are 2 Walmarts, north and south on 27. Go to the north Walmart instead of the south (the north clientele is mostly snowbirds due to the 55+ communities, the southern walmart has mostly rednecks). Lots of other stores by the north walmar as well. There's a great restaurant/gastropub to the north called Crooked Spoon which serves DELICIOUS burgers!! There are several stores and restaurants nearby, it's a great area for full timers to stock up and get various odds and ends. Close to Orlando/ Disney and shopping. Are you affiliated with Lake Louisa State Park ?